Calls to fast-track the construction of new patrol boats to replace Navy’s hard-working but troubled  Armidales, partly to help forestall the valley of death facing the  nation’s naval shipyards, occur amid continuing debate over the cases for  and against  paying a premium to produce advanced vessels in Australia. Make-work programs to preserve ship-building job and skills are particularly controversial . 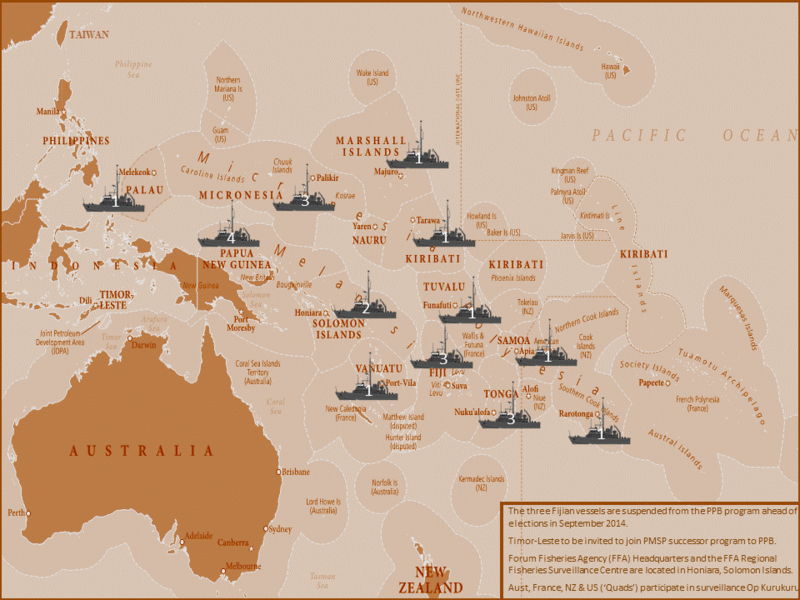 Given the complexity of the arguments  now swirling over whether to replace the Armidales early (the youngest is barely six years old) it’s nice to be able to point to a naval manufacturing opportunity that’s warranted on strategic grounds alone, irrespective of any industrial or other benefits: Canberra should move to implement the Pacific Maritime Security Program . The PMSP is due to start replacing up to 22 old Pacific Class Patrol Boats (PPBs) in 12 countries from 2018 but isn’t funded in the forward estimates. On the surface, the prospect of gifting boats to replace vessels that haven’t always been well-used might appear extravagant with the Defence budget so tight. Current PPB performance varies greatly across the fleet but problems  have included non-security related tasking (such as for VIP transport), some rough-handling including periodic runnings-aground, erratic routine maintenance, and disappointing rates of effort. By 2011, the PPBs were achieving 66 sea-days per boat per year , up from just 36 in 2008, but far fewer than the over 200 for the RAN’s patrol boats (which have two crews). PMSP wouldn’t be inexpensive either. Shadow Assistant Defence Minister David Feeney—an enthusiast—estimates 20 or so steel-hulled boats purpose-built in Australia for regional conditions would cost just under $300 million to deliver. Total costs could reach $1.5 billion over 35 years . Yet the PMSP isn’t just ‘defence aid’. It’s more accurately viewed as a form of forward-defence and regional conflict prevention, which will be good for regional countries but also profoundly in our own national interest. Although far from cheap, it represents a cost-effective investment in being able to help shape, rather than merely react to, regional events. For Australia, PMSP will preserve regional capabilities to police a vast area we’d otherwise have to look after ourselves. Working with local militaries, police maritime elements, and customs services to support their effective self-help is preferable to us asking (or being called upon) to act in other peoples’ jurisdictions. Supported by a small network of posted RAN personnel, PMSP will also promote a continuing welcome for the ADF’s, low-key but visible, enduring strategic presence across our maritime approaches. Familiar and valued cooperation delivers both direct benefits—such as extra reach for our search and rescue efforts or deterring drug-smuggling aimed at Australian markets—and indirect value, such as situational awareness, influence, and opportunities to engage traditional regional partners—the US, France and NZ. It may also moderate any adventurism by actors from outside the region, whether ascendant powers, marginalised states, or investors . For participating countries, PMSP will modernise cooperative efforts to protect marine resources, enforce sovereignty, and counter transnational crime. The program should include enhanced surveillance, coordination, and technical-legal collaboration to make the most of the new boats. The absence of a follow-on to PPB would heighten vulnerability to socio-economic sources of instability. Fishing is critical to regional countries, but they are hard-pressed to protect their resources, having mostly small populations and large EEZs. Illegal fishing already plunders a billion dollars  from regional coffers each year. And economic pressures could contribute to the need for lengthy, costly and risky stabilisation missions. PMSP could also be progressed without a large one-off spend. Introducing a couple of boats per year as the current PPBs reach their maximum extendable lives from 2018 to 2027 would spread acquisition costs. Enhanced aerial surveillance and other potentially expensive components of PMSP could also be added gradually as economic circumstances and operational tempo permit. Cheaper, potentially suitable, foreign patrol boat designs are available, though with some symbolic and practical downsides. NZ could chip in (it already provides PPB personnel) given its Cook Islands and wider responsibilities. And wealthier recipients may value PMSP more if they make a contribution in return for some say in capability specifications. A proportion of costs for non-military vessels might be deemed aid-eligible  for non-strategic tasks such as food security. Hand-me-down Armidales would be prized for their sleek lines—they aren’t your grandfather’s PT boat—and might fill a short term gap, but could also be uneconomical and unsustainable over the longer term. Whatever option Government chooses, PMSP deserves some numbers against it in next month’s budget alongside the much larger figures for grander investments in our maritime security. Karl Claxton is an analyst at ASPI. Map (c) ASPI 2014.